These tips on how to wild camp when bicycle touring around the world will help your budget go further. 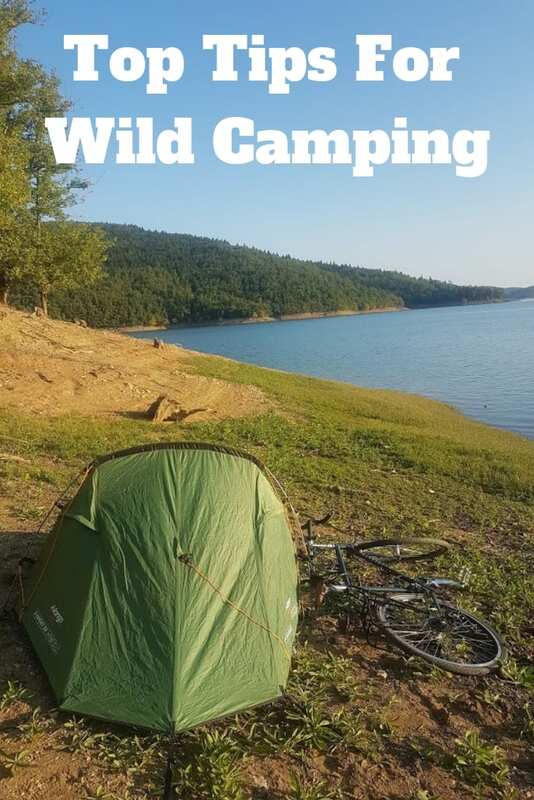 Travel longer and for cheaper by wild camping on your next bicycle tour! At one point or another, most cyclists will wild camp when bicycle touring around the world. Whether it is through choice, necessity, habit or desire, it is almost a rite of passage. It's also a great way to cut costs on a bicycle tour. 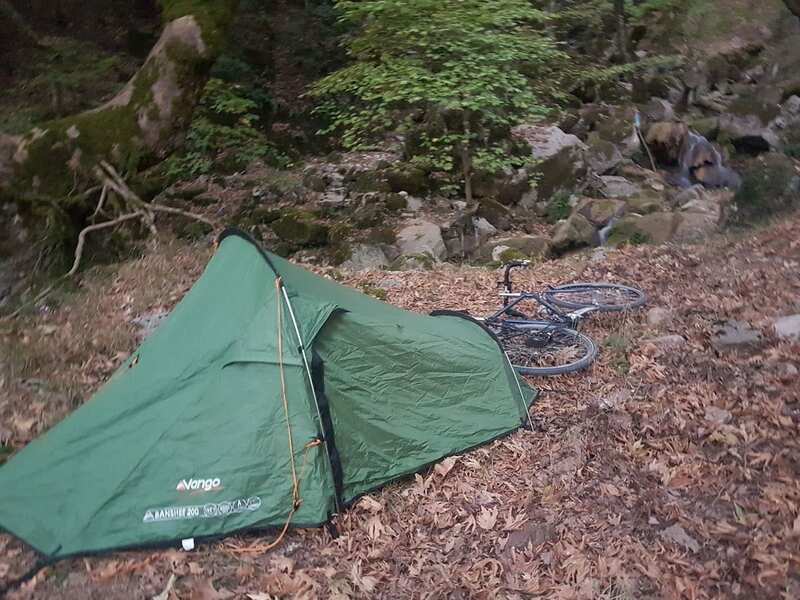 Wild camping opens up new possibilities and experiences, and goes towards making a bicycle tour the unique journey it is. For those that are accustomed to it, these tips on how to wild camp may seem blatantly obvious. You might even have more tips to add. Please feel free to contribute in the comments section if this is the case – Share the knowledge, share the love!! I can add more in my bicycle touring tips section. For those that have never tried wild camping before, the following tips should prove to be very useful. Wild camping is the art of finding somewhere to camp out, and spend the night for free. Most people choose quiet, out of the way places such as fields or woods. I have seen people wild camp everywhere though. On the side of the road, sports fields and even in the middle of town parks! This is a little bit too brazen for me. I prefer the stealth camping approach. Stealth camping has more of an emphasis on not being seen. Yes, no, maybe. It really depends on where you choose to camp and how you go about it. I generally prefer to wild camp where I won't be easily discovered, and so the question never arises. I have been approached on rare occasions by law or even army officials. A friendly conversation explaining that I am camping only for the night leaves everyone happy. Use your brain when it comes to where and how to wild camp, and you will be pretty much left alone. Ok, lets start with the tent. They come in all sorts of shapes, sizes and colours. Which one is best though? A large, bright orange tent that takes a half hour to put up, is not going to offer any advantages to the wild camper! A green coloured tent that is quickly put up and down is the best choice. One with a lower profile would be perfect. The green colour will help it blend into the countryside during the night. The lower profile means that it won't stand out on the horizon. Avoid tents with reflective strips if possible, so that passing cars do not reveal it at night. Note – You don't always need a tent to wild camp. I chose to use just the sleeping back on this warm night by a river. Other people use bivi bags, hammocks, or other methods. Don't leave finding somewhere to wild camp until the last minute. It is far better to start keeping an eye open for suitable spots an hour or two before it is due to start getting dark. Sometimes you will find a place straight away, sometimes it may take a little time. There will be situations, especially in more heavily populated areas, where it may not be practical to find somewhere to camp until it is dark. Sometimes, you just have to push the bike off the road 50 metres or more and finding somewhere flat and quiet. A head torch may be of some use. In these types of areas, it is better to get up at dawn and pack away as quickly as possible. Don't be afraid to ask the locals if there is somewhere suitable to camp for the night. A little knowledge goes a long way. You may even be invited to camp on someone's property or given a bed for the night. Once you have found somewhere you think is suitable, take five or ten minutes to suss out the vibe of the place. Is it too close to a road, near cattle or on boggy ground? I remember one irritating moment when I was setting my tent up, only to discover a family of bears watching me! I hit the road again pretty quickly! Unless you are in a wilderness area or it is common practice to have an open fire in the area you are cycling through, don't start a fire! It will give away where you are camping. Many ‘dry' countries also suffer from wildfires. They are likely to take a dim view of your behaviour if you are discovered! The same goes for loud music. It will give away where you are camping, and may annoy people living nearby. It's best to keep all noise to a minimum. In the unlikely event that someone asks you to move on, try explaining the situation calmly to them. A smile and a friendly attitude may soften them up, and enable you to get your head down for the night. Whatever you do, don't start an argument and scream and shout This is going to achieve nothing, and may lead to problems. It's nice to be nice! 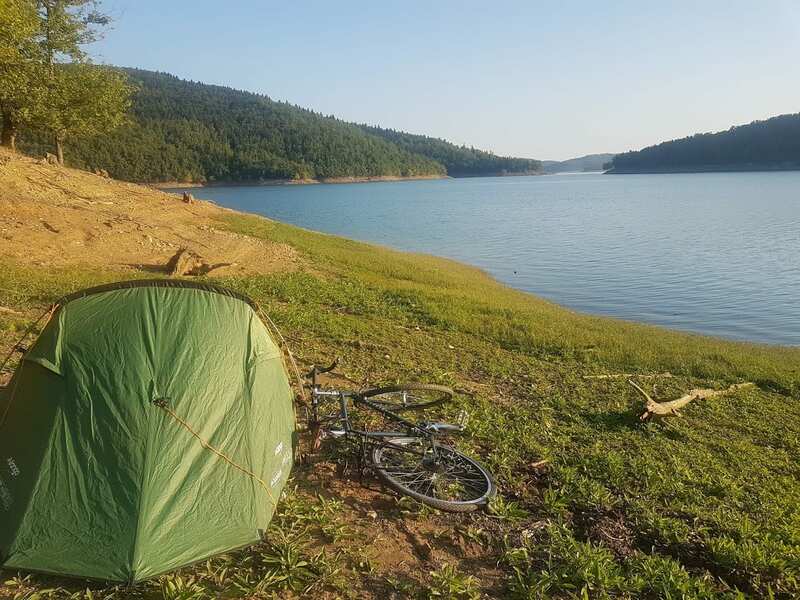 Is wild camping safe when bike touring? Despite what you might think, gangs of armed robbers do not roam the countryside at night looking for wild camping cyclists to rob. This is not to say that it doesn't happen of course, but it is a rare event. Careful selection of where to wild camp and being inconspicuous should be enough to keep safe. In some areas it may be wise to take other precautions. If I think someone may have seen me set up camp for the night, I may tie my bike to my tent with fishing wire. This way I will be woken if someone tries to take it for example. Avoid camping in dry river beds. It only takes a little bit of rain for water to build up and start flowing in them. Then, it could be goodbye tent, bike and gear! Make sure you have enough water to make an evening meal and breakfast the following morning if needed. Taking a water filter when bike touring means you can always have clean, drinkable water. A sponge bath might not go amiss either, especially after a sweaty day in the saddle! By all means answer the call of nature, but do it away from your camp (and preferably not uphill from it!). It might not be pleasant, but do not leave any used toilet paper behind. The following morning, leave the area as you found it. Don't leave rubbish, empty cans or paper where you have camped. Take it with you. Finally remember the Golden rule of Wild Camping – Pitch late, leave early, be as unobtrusive as possible, and don't leave litter behind! I try to read as much as possible from anyone that has a wealth of experience bicycle touring. I’m 64 years old retired on Social Security. I just finished my first transcontinental from Long Beach California to South Carolina and then back to Long Beach. I’m currently staying in Tucson Arizona for the winter until May then I will start back on the road again. But I really would like to do Europe. I’ve been all over Europe when I was in the military. Do you think I could do Europe on 1700 a month. Apologies for the late reply – The Christmas and New Year break got away from me! In regards to your planned bike tour in Europe – I think 1700 (I assume dollars) a month is a great budget. In fact, I think you might even struggle to spend it, especially in the south of Europe! In 2016, I cycled from Greece to England, with the intention of just splitting it up between paid camping and affordable hotel rooms. The two month trip cost around 750 Euros a month, and I wasn’t particularly looking to save money along the way. Your budget will be more than suitable, and cover additional expenses such as entrance fees to historic sites etc. If you pedal as far as Greece, get in touch, and if I am around we can cover some miles together!